Q:WHAT IS A CORTISOL PUMP? A: Technically is no such thing as a cortisol pump. It is an insulin pump that has been filled with SoluCortef instead of insulin. Currently, there is no product labeled a “cortisol pump,” but that doesn’t negate the benefit the pump can bring to corticosteroid dependents. Q: Does the pump attach to your skin? A: Yes. The inset has a small needle that puts a tiny cannula into your body. The cannulas are teflon or metal and come in different sizes and angles. Which kind you need/like depends on your body type and personal preference. See the recources page for more info. Q: Do you wear it all the time? A: Yes. Most pumps are at least water resistant, but some DO need to be removed or protected from water. Others are safe for showering or swimming. Mine is a Tandem T-Slim, which is waterproof (Tested to 3 feet for 30 minutes (IPX7 rating) ) I do shower with it, and of couse I sleep with it on. Click here to check out the resources page for tips and products for wearing the pump. A: If you’re doing it right, no. It doesn’t hurt. The needle that inserts the cannula is tiny. The cannula is even smaller, if you’ve inserted it correctly, and got it in a good place, it shouldn’t hurt. Many insets have auto-inserters, these do all the work for you. Its convenient, and I barely feel anything. If it DOES hurt you, there may be a problem you need to address. Q: How often do you change your insets? A: I change my inset after 3 days. This is pretty typical, but some pumpers have special sitations that require them to change every 2 days or even every day. It is not advised to use an infusion site more than 3 days as it will have reduced absorption and could pose an infection risk. Q: Is there a higher infection risk with pumping? A: Anything that breaks your skin can potentially be an infection risk. If you follow good hygiene, keep your surroundings clean, wash your hands before touching your inset or performing a refill, use sterile supplies, and disinfect the skin with an alcohol swab, the infection risk is no greater than that of an insulin pumper. Site infections are rare, but they do happen. They are almost always minor and can go away on their own, but they should never be ignored. A site infection will be red and possibly swollen and itchy. It will feel warm to the touch and redness will expand from the infusion site. Your doctor can prescribe a broad spectrum anitbiotic, and an antibiotic ointment such as Neosporin can help as well. When properly treated they clear up very quickly. Q: How do I get a pump? A: You, of course, need a doctor. If you have adrenal insufficiency, you should already have a doctor. After you and your doctor decide on this treatment, either you or the doctor can contact the maufacturer of the pump you have chosen. You might also call your insurance company first and see which insulin pumps they cover and how much of it they cover as that will likely influence which pump you choose and which company you’ll need to contact. Your doctor might also have a preference of manufacturer. Once you contact the manufacturer they will contact your insurance company and get the ball rolling. They will also contact your doctor for a prescription. After everything is approved and paid for they will ship your pump. Most maufacturers will have a representative meet with you to show you how to operate your pump. 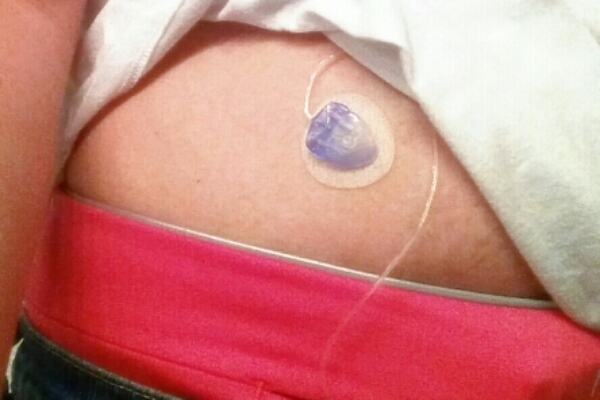 This is the most convenient way to get an infusion pump, but definitely not the only way. There are alternative ways to get an infusion pump, so do not be discouraged if this route doesn’t work for you. Q: What supplies do you need? A: You will need Solu-Cortef, Sterile water or Saline for mixing, your pump may require syringes to mix the medication and fill the cartidge. Some pumps come with syringes included. You will also need alcohol swabs, infusion sets and cartridges. Q: Who is your Endocrinologist? A: This information would not help you, as my endocrinolgists were zero help at all with the cortisol pump. I got the “I’ll research it” line, and nothing more from them. I’ve done all of this myself with my primary doctor’s support and guidance from other HC pumpers. I have a question dose cortisol pump measure cortisol and then adjust amount on itself of how much need to be injected ? It is very important for me because I have cortisol jumps once to high once to low, therefore is impossible to treat me. The cortisol pump does not measure your cortisol. There is no technology outside of a laboratory that can measure cortisol. This is one of the biggest obstacles to managing adrenal insufficiency, whether it be with pills or a pump, we are all left to guess how much medication we need. It’s actually very common for cortisol levels to fluctuate as your body reacts to stress. This does not make you impossible to treat. Difficult yes, but adrenal insufficiency is almost always difficult. Thank you! I came here after reading your recent post (from September 14) recounting 15 months on your pump. As someone with AI who has had roughly as many good days as bad months, it’s very encouraging to see the possibilities a pump may afford. Even more helpful are the specifics covered in your FAQ. A few more I’d love to see sometime: a brief, bullet-item breakdown of how much time you spent each day/week dealing with pump-related logisitics. Your approximate initial and monthly costs, and whether or not insurance covers them. Links to any posts related to salient pump-related events or issues, such as what it was like having it put in for the first time, or whenever you may or may not have gotten a pump-related infection or medical issue, etc. Thanks again, and don’t worry about responding to this, or any of my request. 🙂 Keep on enjoying your recaptured life!